I realize I haven't done a good job of sharing my baby bump with you so far. But rest assured, it's there and growing day by day, well beyond the "is she or isn't she?" stage, thank goodness. It's definitely to the point that most of my regular clothes don't fit and my new requirement for tops and dresses is that they must be either knits and/or have an empire waist. Let the maternity sewing officially begin! I have been coveting this BWOF pattern every since I saw Birgitte's fun silk charmeuse version. Even though it's not a maternity pattern, it has the necessary characteristics - an empire waist and a flowy, roomy area below the bust. I knew my bust had grown, I had to buy new bras after all, but it never dawned on me that I'd be playing for Team FBA now! Sigh... I did wear the top once, to my BurdaStyle sewing club get-together last weekend. The poor little buttons are just straining to keep the top closed; if I just button the bottom two and wear a cami underneath, it's still obvious, so I think that'll be the last time I can wear it until I have my post-pregnancy, post-nursing bust back. My only modification to this pattern was to gather the sleeve hems onto a narrow sleeve band, instead of finishing the sleeve hems with elastic in a casing, which I think tends to looks Becky Home Ec-y (that doesn't mean you won't ever see me use that finish, though!). Still, I couldn't get the style out of my head, I really like it and I find the style to be flattering as maternity-wear. Lightbulb moment - make it in a knit! The bodice is close enough to fitting, a knit would easily accommodate the negative ease situation, and no FBA necessary! 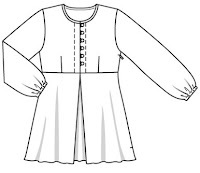 1) I cut the upper front bodice on the fold instead of in 2 pieces, and scooped out the neckline a bit. Not having to stitch up tiny bias button loops and a bias band finish for the neck were major timesavers! 2) I lined the bodice with black tissue knit, mainly to give it an easy neckline finish. 3) I borrowed an idea from Jazz Couture's gorgeous LMB tunics to finish the sleeve hem with a self-fabric drawstring in a casing. My drawstrings don't look quite as delicate as hers, next time I would sew them a bit more narrow. 4) Because of the stretchiness of the knit, I was able to omit the invisible zipper in the side seam. I am so happy with the knit version of this pattern, and the best part is with all of my modifications, it's a pretty quick little garment to sew up. I have plans to make another, in a dress length, and I think I'll change up the front pleat for a little variety. They both look great, although I realise the problem with the woven one. I don't think I will do maternity wear, it seems like I wouldn't get much use out of them, but that's just my view. For now I'll focus on other projects. Wow, 27 weeks already! You definitely have that glow. :) I like your new tops, and what a great idea to make the pattern in a knit. Good thinking 99! Pregnancy is such an exciting journey. You look ultra healthy and ravishing. I like the knit better - much more comfortable for you. Oh, i'm sorry for you that the pruple top didn't fit. Both tops look so nice. I agree you look great indeed! What a good solution! You should definitely make more because wearing the knit top must feel so good right now. Btw, you look good! Very clever of you to make this pattern up in a knit. Though I love the purple one too...it's a great pattern. I agree you're looking radiant Christina. Genius! The knit looks comfy and stylish - great pattern! Great way to make it work! You look stunning! What a great idea, I like it in the knit. You look great. Fabulous!!!! And look at you - my goodness how time has flown. You and baby look fantastic! Wonderful top as a maternity top. My solution for lots of things is to use knits to give more ease. I am not pregnant but have been many times and need the room. Pls I like the drape of knits. And I think rayon jersey is the best. It's great that you can sew your maternity clothes. I didn't start making clothes until after all my kids and it would have been nice to supplement with cute tops when the stores were lacking. Nice job! Congrats on the baby too. I've been reading your blog for a few weeks and have used your ideas in my own work. Thanks for sharing. I really like your blog. Your work is very interesting. You are very good at sewing. How clever! Both tops look great! Such a pity the purple tunic has to wait to be worn: it's gorgeous! But the knit one is beautiful as well. I like how you finished the sleeve hems. They look much better than BWOF's elastic. They are great, both tops. How clever to make it in a knit. And you look beautiful, in all your pregnant glory! You look so awesome with your baby bump. The top looks great on you - I love your changes. These both look great. I love a variation on a theme, and you've shown how well 1 pattern can make two different looks an fits! And... you look adorable with that baby bump! I always thought about making this one up! Both look great on you! Love that you made it work in a knit, too. Very cute. This will be a nice top for the first week or two home with baby too. Love the ties at the sleeve. I can't beleive how adorable you look! I love the knit version. I 'm always too scared to switch around the recommended fabrics. Your's worked perfectly. Just think, after baby you'll have a new top waiting for you in the woven! Those tops look fantastic on you!!! You always look so stylish. The tops look great! You've demonstrated great problem solving skills. As you know, that skill comes in handy when children are around. Those are very cute tops!! Gorgeous tops! Thanks for sharing...I will soon be sewing maternity wear for a special someone (NOT ME), so I definitely will give this pattern a whirl! You look fabulous! What a great solution! Both tops look amazing - you've done a wonderful job. And you are glowing, your pregnancy clearly suits you! I love knit fabrics (especially lycra) for their ease in fitting! Both of the tops look great and you look fantatsic! My sister in law is due with her and my brother's first baby in early May and I made a maternity dress for her a few weeks ago. Lots of elastic in the bust, empire waist and very fully skirt. The thing is, I wanted to keep it and I'm not even pregnant! I guess that is the beauty of empire styles, right? I love your knit version! Easy and fast! I love your other version also, I made that one too, but never wore it because it made me look pregnant, when I had just finally lost the extra weight I had put on with my two pregnancies...so I was not looking for that look, but you are pregnant and it's a great idea to turn it into a knit.. you just gave me a few ideas for other patterns I have...thanks! First of all, I have to say you are looking so good! Pregnancy agees with you. Love both tops, and how clever to adapt it an easy knit top. I am sure you will get lots of wear out of the brown one and some more out of the other one later on. Such a good thought for the knit - and it turned out really well. Fabulous maternity tops. I bet you are one of the most stylish mamas around! You look great. See, you don't need special maternity patterns - both versions of your top look great. As do you, wow it seems like only yesterday you announced the news on your blog with a tiny bump! 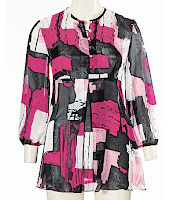 I have loved this top (but not made it as yet) since I saw it in the magazine. Love both your versions and luckily as pregnancy does have an end-date you will still get use out of your first version! Great idea to use a knit! The knit is just perfect, save the pretty woven version for after the baby comes, you'll look stylish and comfortable while your belly gets back to normal. The title of your post is part of my basic philosopy, lol. That is so cute as a maternity top! You look absolutely cute. Cute top! Great tops! I wish I had sewn myself some stylish clothes during pregnancy. Hang onto to that first top, because the colour looks absolutely fabulous on you. Wow, you look adorable. & I love the purple color of that first top. I'm not an english speaker so the only thing I can tell about your blog is WHAOUUUUUUUU!!!!!! I like it, everything is beautiful, j'aime, j'aime, j'aime c'est trop beau!!!! Congratulation from Guadeloupe (french west indies) and see U next.